For years, the For Dummies books — the good ones, at least — featured a healthy quantity of humor. Part of that humor included cartoons. They’re funny cartoons as well, some of them being incredibly spot-on. And the readers enjoyed them. O how I wish that were still the case. When DOS For Dummies was being written, I had no desire to add cartoons. In fact, it was my editor who phoned me up and said, “Oh, by the way, we’re sticking cartoons in the book.” I protested that decision most vehemently. Fortunately I was overruled. The cartoons in For Dummies books turned out to be decent and appreciated. From my computer book publishing history, however, that wasn’t always the case. Back in the mid-1980s I worked for CompuSoft publishing. The books featured cartoons as a way to lighten up the learning process. The books were very consistent, very popular, and the humor helped. Yet I received a lot of complaints about the cartoons. Some readers really disliked them. Figure 1 shows a typical cartoon that appeared in just about every one of the Learning BASIC line of books. The cartoons were penned by Bob Stevens, who was famous as an aviation cartoonist and illustrator. Figure 1. 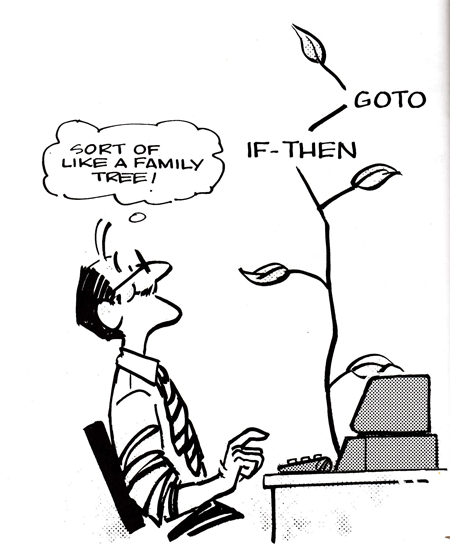 A Bob Stevens cartoon from CompuSoft’s Learning IBM BASIC. Used illegally without permission. You can see more cartoons that appeared in CompuSoft books by visiting fellow CompuSoft alum Morgan Davis’ web site here. I didn’t think anything of the cartoons at first, but after getting complaints I leaned against them. After all, I’d prefer not to read angry letters (this is before email), but the publisher insisted, so the cartoons remained. When my DOS For Dummies editor phoned to tell me that cartoons would be a staple in my book, I cringed. I didn’t want more angry letters. My fear turned out to be misplaced. People loved the cartoons. They were so much better than the earlier cartoons I had to contend with, as shown in Figure 2. Figure 2. 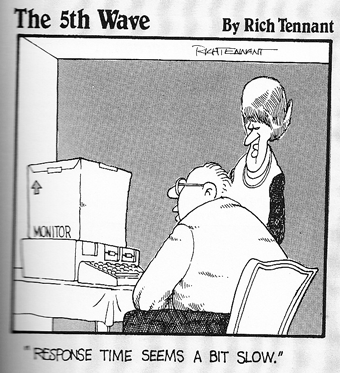 The first cartoon that appeared in DOS For Dummies, used completely without permission. For Dummies books no longer feature the cartoons by Rich Tennent. Penny-pinching by narrow-minded weasels has replaced the cartoons and diminished the books’ rich value. Instead of humor you now see bland “In this part” text, coupled with an insipid graphic. It’s boring, and publisher wants it that way for every book. It was a terrible decision by the higher ups to remove the cartoons. As I’ve told them eternally, they just don’t understand what makes the books special. Sure, they’ll save some money by not having to pay Tennent, but this decision makes the books less classy. That kind of proves my point about them being narrow-minded weasels. Where I once despised the cartoons, then grew to love them, now I find myself missing them.